A limited number of attendees will receive a sheet of resin parts and a decal set as the mini-kit. Mike Skibbe has created O, S, and N scale mini-kits for attendees marking those scale preferences. The HO scale resin parts and decals are used in combination with a Tichy underframe, a modified Accurail wood reefer body, truss rod parts, and some styrene pieces to create a distinctive model. These extra parts will need to be obtained by the modeler. Frank created the HO scale resin parts masters and Tom Madden cast the parts. Ted Culotta created the fine decal art. 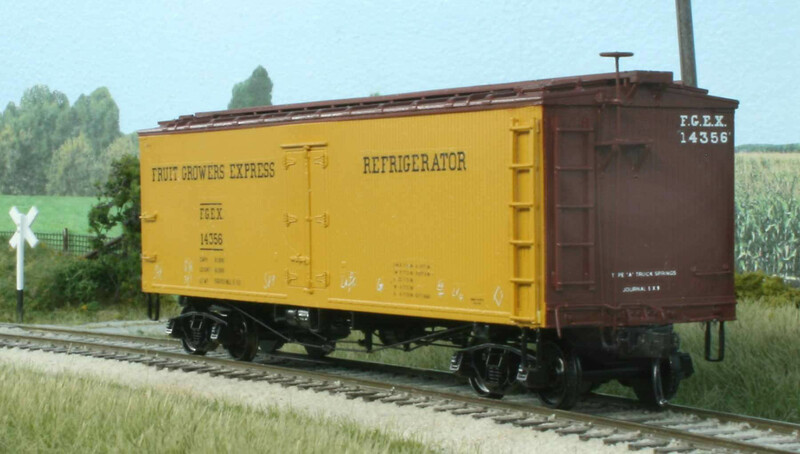 The prototype FGEX reefers originally came from two railroads. In 1923 the Louisville & Nashville refrigerator fleet was merged into FGEX. These L&N reefers were numbered into the 20000-21849 series. In 1925, the Baltimore & Ohio joined the Company and their reefer fleet was also added to the FGEX fleet. The B&O had a number of older cars. Their truss rod cars became the 14000-14998 series under FGEX. Resin Car Works had hoped to offer a new kit or two at the RPM but our best laid plans have not worked out. The SFRD reefers have sold very well and are now out of production. Several Resin Car Works minions will be attending RPM Chicagoland. We look forward to celebrating the 25th anniversary of this prototype modeling event, even if we don’t have new kits for you. See you there! What was used for the truss rod parts?